Termites aren’t the only wood-munching pests around. Wood bores, powder post beetles, carpenter bees and carpenter ants all bore and tunnel their way through wood in buildings, causing structural integrity issues. 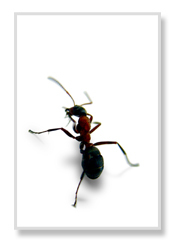 Holes, fine powder or dust, and the physical presence of these pests give an indication of their feeding grounds. Chemical treatment is the most effective treatment. Crickets can get inside and feed on a wide variety of fabrics, such as cotton and wool. They may gather in large numbers at night around lights giving off that ever-present chirping noise. Silverfish will eat paper, cardboard, and certain fabrics. Millipedes feed on decaying organic material and are usually found outside in mulch and flower beds. They can make their way inside. For crickets and millipedes, total extermination outdoors is impossible but have great success indoors. Pests of this sort are best treated chemically.